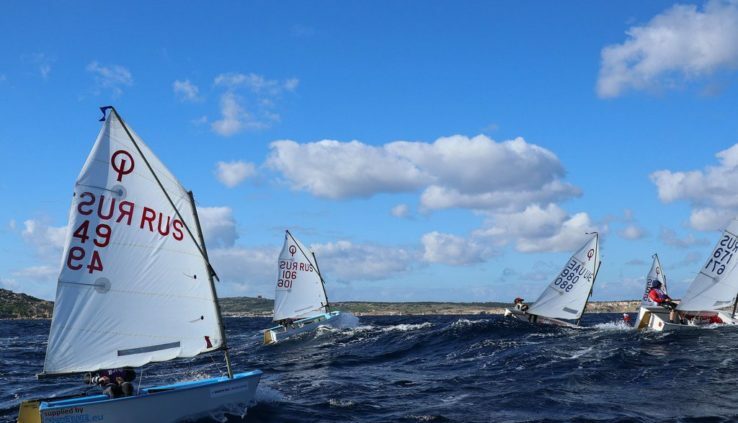 Malta ended the 19th season Euromed international regatta class “Optimist”.The competition was attended by 30 of the Russian juniors. The results of ten races is the best among the Russians became an “academician” Andrei Fedorov, who took 20th place in the fleet of almost 150 participants. From the first launches of the Russian juniors have declared themselves. On the first day in three parishes showed Andrei Fedorov and Kirill Shanenkov. Alexander Minibaev won the first race of the regatta in their fleet, and Marina Babkina and even impressed everyone with his third coming that day, despite the fact that she was in the lead most of the race. But the success of last season, when “academician” Maxim Shaposhnikov was awarded the bronze medal of the regatta, retry failed – too unstable were the results guys. Parishes in a dozen alternated with frankly disastrous races, most often due to a bad start either the wrong tactics in the first tacking. One of the favorites of the fleet, Cyril Shanenkov, twice came under the black flag. Similar errors are repeated and Minibaev and Marcus, and a number of other athletes. And yet, the results of the Russians should be considered in the positive dynamics. Eight athletes program OptiPro qualified for the gold fleet. In addition, the first 50% hit and Muscovite Maria Struk, who trains autonomously. Graduate school “the Rout”, Daniel Pepper has won a landslide victory in the silver fleet, “Akademik” Nikita Black was fifth in the Cadet standings. Beginners class were competing in a separate fleet. Here, the sailing Academy, said ten members of the 2007-2009 R. under the guidance of coach Kristina Ezhova. In this group the best was Yegor Denisov, who confidently held a race, balancing between the eighth and eleventh place in the standings out of the 26 participants in the four countries. In the end, Denisov took the tenth place with one ward in the top three and five finishes in the top ten.